Pick up a drawing utensil, because this remarkable storybook resort inserts guest right into the heart of animation. Art of Animation, Animal Kingdom Lodge, Fort Wilderness and Saratoga Springs Resort are among the resorts with pool refurbishments planned. Flippin' Fins and The Big Blue Pool are scheduled for brief closures. All three pools at Disney's Art of Animation will be closing at various times during November. I stayed at this resort for a senior trip when I graduated high school. Me and 4 other friends. It was also the first experience I've ever had staying onsite at Disney at the time. We had The Lion King Family Suite! It's a really nice resort! It is definitely one of the most popular out of the value resorts, despite the extra price. If you're on a tight budget, any of the all-star resorts can serve the exact same purpose as this resort. If you're able to spend the extra money, though, I'd highly recommend it! It is very nice. The staff was amazing. Perfect particularly for families, or high school/college groups! Also, I do personally recommend spending the extra bucks for the family suite! It is very spacious and really nice! We have stayed at this resort twice. Love the Cars suite...... the theme is fantastic and having two bathrooms with two little princess and the wife is absolutely amazing. Cant wait to stay again. Walk to the Mermaid rooms is a bit long and the walls are on the thin side, it's fine for a place to crash after a busy day. We were so tired that the noises coming from either side didn't keep us or our 2 year old son up overnight. Food court was clean but crazy busy during the morning and evening rushes. Options are somewhat limited for the picky eaters among us, but the food was your average WDW food court fare and was always hot (where applicable) & fresh. The feature pool is awesome. We loved the zero entry aspect. Our aforementioned 2yo could run around and splash in the shallow end without having to worry about a steep drop-off to a 'deep end'. Overall theming is great. Our son loved the Nemo gulls randomly saying 'mine' atop one of the buildings. All the things to look at on the grounds and on the buildings made the walk back to the Mermaid rooms not that bad. That being said, if you're going directly to the WDW bus stops, take the sidewalk on the parking lot side of the buildings. It's more direct and you don't have to cut through the main building. I will not ever return to this resort. The bed was one of the worst I have ever slept on in a hotel. The distance from my room to the buses and breakfast was about a mile away. I wish I was exaggerating. Oh yeah, and right outside my room at 8am, they decided to mow the grass for 30 minutes! 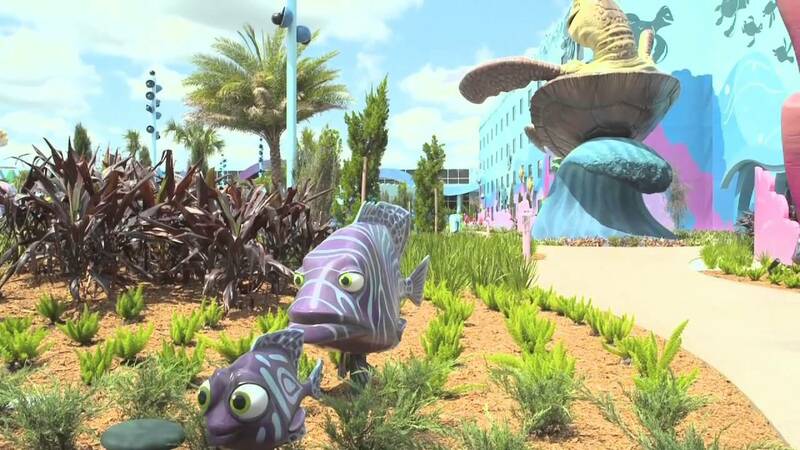 Disney's Art of Animation Resort was announced on 12 May 2010. The new resort will feature quality family suites designed around four unique themes: The Lion King, Finding Nemo, Cars and The Little Mermaid. Located adjacent to Disney’s Pop Century Resort, the new resort will include 1,120 family suites in The Lion King, Cars and Finding Nemo wings, and 864 themed rooms in The Little Mermaid wings - for a total of almost 2,000 new units. Suites will feature both a living room and a bedroom, offering added space for families. Disney’s Art of Animation Resort, the 26th resort at Walt Disney World, will be one-of-a-kind, with themed building exteriors and room interiors, and larger-than-life icons from the animated films in the courtyard areas. Walt Disney World Resort currently features 25 uniquely themed, Disney owned-and-operated resort hotels with more than 26,000 guest rooms. The new resort is expected to create more than 800 construction jobs, beginning immediately. Opening Dates: Finding Nemo suites May 31 2012, Cars suites June 18 2012, Lion King suites August 10 2012, Little Mermaid rooms September 15 2012. Family suites are 565 sq ft and accomodate 6 guests in 2 bathrooms, master bedroom, and 3 separate sleeping areas. The master bedroom features a queen size bed, with the living area featuring a full size sleeper sofa and full size Inova TableBed that converts from a table to bed. The kitchenette includes a fridge, microwave and coffee maker. 2 LCD TV's are included, and the suites buildings all have interior corridors. Value rooms are 277 sq ft and sleep 4 in rooms with either 2 double size, or 1 king size bed. Landscape of Flavors quick servce food court, features 606 indoor dining area and outdoor seating.